I couldn’t help myself when I came to the Tolkien section at the bookstore recently and found a small paperback with two short fantasies I’d never read. I picked it up thinking of adding it to my reads for Carl’s Once Upon a Time II challenge, and I’m glad I did. I enjoyed both stories, and realized once again how much I love the work of J.R.R. Tolkien. 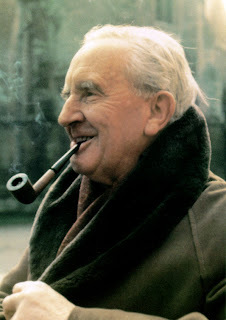 As with all of Tolkien’s works, the story alone is wonderful, but it is also rich in meaning and background. I loved the idea of this star being a gift of fantasy, and a gift that enables the bearer to see the world differently than those around him as well as giving him access to the wonders of Faerie. I also love the idea of having to pass it on to a new generation, so that there is always one person in Wootton Major with that special vision and that ongoing connection to the other world. The second novella was Farmer Giles of Ham, a humorous story of an unlikely hero and a bothersome dragon. It was entertaining and fun, and definitely a Tolkien tale. “As you like,” said Chrysophylax, licking his lips again, but pretending to close his eyes. 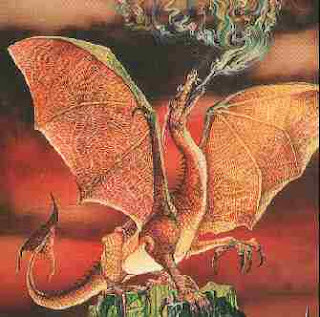 He had a wicked heart (as all dragons have), but not a very bold one (as is not unusual). He preferred a meal that he did not have to fight for; but appetite had returned after a good long sleep. The parson of Oakley had been stringy, and it was years since he had tasted a large fat man. He now made up his mind to try this easy meat, and he was only waiting until the old fool was off his guard. This entry was posted in Challenges, Fantasy, Favorite authors on May 26, 2008 by Robin. I love that picture of him. He looks so friendly and hobbit-like. I agree with Nymeth — that’s a lovely photo. I’m almost embarrassed to admit I’ve yet to read any Tolkien (although I have a book of his art). But, I’ll get to him, one day! I read Tales from the Perilous Realm for this challenge which had these two plus poetry in The Adventures of Tom Bombadil and Leaf By Niggle. I also read Roverandom this year which was my favourite of his short children’s stories. If you loved these two I definitely recommend the other three. Heee! I do so love Tolkein’s tales, even though I think I haven’t read any of it since…. eighth grade maybe? That was when I finished the Silmarillion, if I recall. Nymeth, I love that photo of him, too…except that I thought he was quite Gandalf-like! Rhinoa, thanks for the recommendations. I loved the character of Tom Bombadil in the LOTR, but didn’t know there was a book of his adventures. I’ll have to see if the library has Tales from the Perilous Room and read those two. Heather, I’ve never read The Simarillion, but have it on my shelf! Thanks for tagging me for the meme. It’s a nice one, so I’m in the middle of writing my responses and will post them soon. A funny story about reading the Silmarillion: when I was in ‘junior high’ (7th and 8th grades), we moved from classroom to classroom as a class to be taught different subjects by different teachers. They had us move in a counter-clockwise circular direction between classes, going from room to room, rather than going straight to the destination room via the hallway. So if there was a class that didn’t move from room to room between two classes, you’d walk through their classroom on the way to your own next class. One time in seventh grade I was completely engrossed in reading the Silmarillion while walking from one class to another. We passed through a room in which a class was staying, but my assigned seat for that room, which happened to be in the front row in a spot we passed right by, was open. Without even thinking I sat down—I was so deep into the book that I didn’t even realize that room wasn’t my destination. Heather, that’s a great story!